The shooting at Santa Fe High School brought immediate expressions of support and concern from statewide and national leaders, including Gov. Greg Abbott, who flew to the school Friday afternoon. It was 17-year-old Santa Fe High School junior Dimitrios Pagourtzis, authorities say, who entered his southeast Texas school Friday morning, weapons hidden beneath a long black trench coat, and killed at least 10 people, most of them his classmates. The shooting, which began before 8 a.m., left at least 10 more people wounded, one of them a school resource officer. Pagourtzis, who is now in police custody, appears to have used two of his father’s legally owned firearms — a shotgun and a .38 revolver — to carry out the attack. At least one other student at the school is considered a “person of interest,” local authorities said. A junior who had reportedly played on the school’s junior varsity football team, Pagourtzis gave few hints that he was capable of such violence; any “red-flag warnings were either nonexistent or very imperceptible,” Gov. Greg Abbott said Friday afternoon at a news conference outside the school. “Unlike Parkland, unlike Sutherland Springs, there were not those types of warning signs,” Abbott said. He added that Pagourtzis had written about the shooting in his journal and planned to kill himself after carrying out the attack. He has been charged with capital murder and remains in Galveston County jail without bond, the school district said. Pagourtzis reportedly owned a “born to kill” T-shirt, a garment shared on his now-defunct Facebook page. A little over three hours after the shooting started, Santa Fe ISD reported that "explosive devices" had been found at the school and off campus. Abbott described two of those devices as a "Molotov cocktail" and a "CO2 device." Authorities said they obtained warrants to search two nearby residences — one reported to be the suspect’s home address — as well as Pagourtzis’ vehicle. The shooting started just as the school day was beginning. Students at the scene have reported seeing a shooter walk into an art classroom. Liberty Wheeler, 14, said she heard five shots ring out and could “smell the gunpowder”; Trey Lemley, 17, described seeing several bodies and pools of blood, the Houston Chronicle reported. 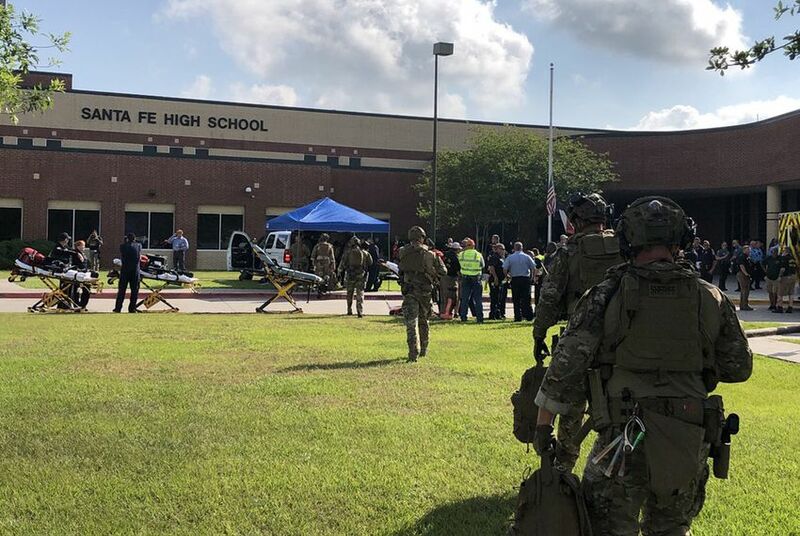 "We experienced an unthinkable tragedy at our high school this morning," Santa Fe ISD Superintendent Leigh Wall said. "We have experienced an outpouring of support from across the state, and we appreciate your continued prayers for our students, staff and community." 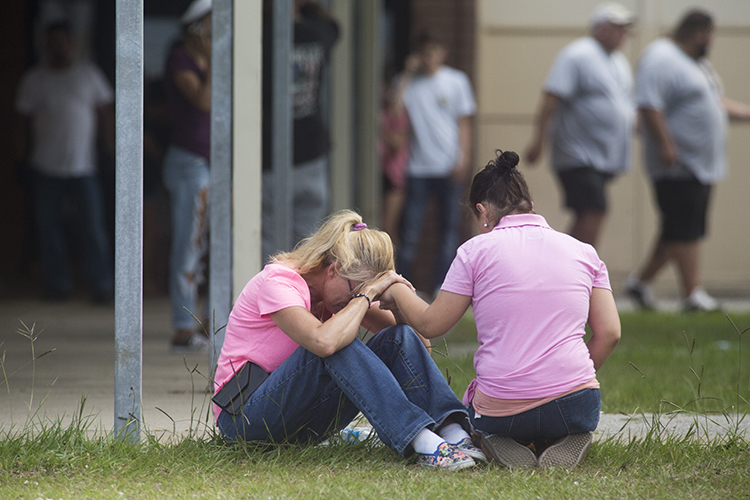 Michael Stravato for The Texas Tribune People outside a middle school set up as a reunion point for parents and students in Santa Fe, Texas on Friday, March 18, 2018 after a gunman killed at least 10 people at Santa Fe High School. Friday's shooting is the latest tragedy in a spate of gun violence across the country, the victims of which have often been students and teachers. In November, 26 people were killed at a church in Sutherland Springs. Just this week, a school resource officer intervened when a former student opened fire at Dixon High School in Illinois. Last month, students at Santa Fe High School participated in a student walkout against gun violence. They sat outside for 17 minutes of silence. The shooting brought immediate expressions of support and concern from statewide and national leaders. At an event Friday morning, President Donald Trump said, "This has been going on too long in our country." "Too many years, too many decades now," he said. "We grieve for the terrible loss of life." The tragedy also spurred familiar narratives — and familiar disagreements — about gun control in the state. Santa Fe High School, which sits in rural Galveston County, has good test scores, above-average teacher pay and an 89 percent graduation rate. It enrolls about 1,400 students. Before this week, was perhaps best known for its role in a 2000 U.S. Supreme Court case about school prayer. Students and residents of the community expressed disbelief Friday that tragedy had come to their town. "The world, I just don't like what it's becoming," Santa Fe High School 10th grader Dakota Shrader told the Houston Chronicle. "Every school shooting, kids getting killed, innocent kids getting killed. No family should have to suffer that just because somebody wants to be selfish and go out and hurt other people. It's just not right at all."